By now, most of us are well aware of the health risks that are associated with obesity. But did you know that excess abdominal fat in particular carries its own set of risks. 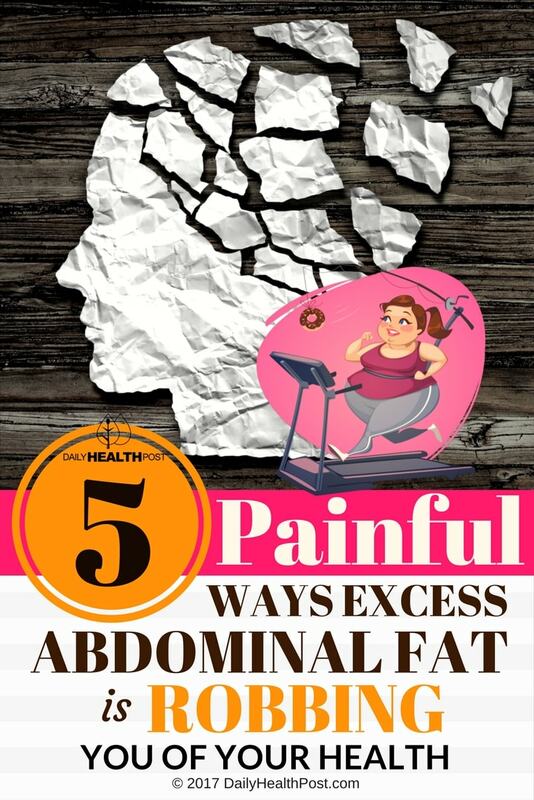 A high waist-to-hip ratio, caused by visceral fat setting up shop inside your abdomen and around your organs, has been associated with the following five long-term health issues. Read on to find out what they are. Last year, a team of Finnish researchers found that a large waist circumference is related to decreased lung volume and function. In comparison with other healthy, non-smoking adults who did not have excess abdominal fat, those who carried more fat performed far more poorly on spirometry (breath measurement) tests. Over time, this decreased lung function can lead to a narrowing of the airway and ultimately chronic lung diseases like asthma. Another 2012 study found a significant correlation between abdominal obesity and high incidence of arthrosclerosis and arterial stiffness. The researchers studied both individuals with abdominal obesity and general obesity, as well as healthy individuals, and discovered that for every 0.1 increase in the waist to height ratio, arterial issues worsened. This tendency was particularly pronounced in people with excess abdominal fat. Arterial degeneration can lead to stroke and various forms of heart disease. Visceral fat – the type of fat found in people with abdominal obesity – produces a number of hormones that can wreak havoc on your metabolic system. These hormones can trigger changes to insulin receptors in your body, meaning that insulin starts to become less effective in helping to regulate your blood sugar. This is, of course, one of the major causes of diabetes. It turns out that what’s going on in your gut can have a big effect on your brain. A 2010 study found that a high waist-to-hip ratio, as well as the presence of abdominal visceral fat in general, is linked with low brain volume. Low brain volume has in turn been linked with general dementia and may also be a contributing factor in Alzheimer’s disease. Visceral fat can be turned into free fatty acids by the body, which results in the production of LDL (also known as “bad”) cholesterol and triglycerides. In addition, the free fatty acids also reduce the body’s level of HDL (also known as “good”) cholesterol. Along with abdominal obesity’s relationship with arterial degeneration, the cholesterol-related effects of excess belly fat are a perfect storm for heart disease, high blood pressure, and stroke. Where you tend to store your fat is largely dictated by your genes, but if you have excess abdominal fat, there are ways to minimize your risk. According to the experts, exercise is the best way to get rid of that visceral fat, even more so than calorie restriction (although sticking to a healthy diet is always a good idea). Aim for half an hour to an hour of exercise most days of the week, and with determination, you should be able to shrink your belly and your chances of developing any of these long-term health problems. If you’d like more information on this topic you can find it here. What can you do to eliminate your excess abdominal fat? Or have you had success with diet and exercise?